The Bergen County Central Trades and Labor Council, AFL- CIO, in partnership with the Bergen County Building and Construction Trades Council, AFL-CIO, would like to invite you to attend our annual Cocktail Reception on Thursday, September 27, 2018 from 6:00 pm to 9:00 pm at the Stony Hill Inn located at 231 Polify Rd, Hackensack. The proceeds of this event will benefit the CLC’s Committee on Political Education (COPE) and support our Labor 2018 Member Mobilization Campaign. As you know, there is much at stake for working people in this year in the upcoming Gubernatorial and State Legislative elections. Electing labor friendly candidates at all levels of government is crucial to achieving a working families agenda for our members. The Bergen CLC hopes to build upon past success and continue to expand its program. These goals can only be achieved by a well financed and resourced Central Labor Council with the solidarity of the entire labor movement. For more information, please contact Janet Giuliano at (201) 967-5953. On Wednesday, June 6, 2018, the delegates of the Bergen County Central Trades and Labor Council, AFL-CIO (CLC) voted to endorse candidates for Bergen County Executive and Freeholder, and recommended endorsements for Senate, Congressional, and State Legislative races, which were voted on at the NJ State AFL-CIO Legislative and Political Conference on June 12. We are pleased to announce the seventh annual Mike “Doc” Doklia Memorial Beefsteak Scholarship Dinner. Mike was a former Director of the United Labor Agency of Bergen County, a former Vice-President of this Labor Council, and a former Trustee for this Scholarship Fund. We are honored to name this dinner after Mike. The Beefsteak Dinner will be held on Wednesday, July 11, 2018, at the IBEW Local 164 Hall, 65 W. Century Road, Paramus, NJ, from 6 – 9 PM. Click here to download an order form to purchase tickets. The Abe Solomon Scholarship Fund, sponsored by the Bergen County Central Trades & Labor Council, AFL-CIO, has for the last forty years, awarded one hundred eighty-eight scholarships to union members and their families. We do this to ease the burden on union families trying to cope with the ever-increasing cost of a college or post-high school educational program. Our scholarships are given in honor of two men who were part of the labor movement in Bergen County. Abe Solomon was a past President and a leader in the early years of this Labor Council. Ed Purtill was a past Director of the United Labor Agency of Bergen County, and was passionate about community service. We are proud to honor these two giants of our labor history. The cost of the Dinner will be $50.00 per person, or $500.00 per table often. Please make all checks payable to the Abe Solomon Scholarship Fund. Please RSVP by June 29, 2018. All proceeds will go to the Scholarship Fund for future awards. Thank you in advance for your continued support, not only from the Scholarship Trustees, but also from the recipients of these scholarships. The Bergen County Central Trades and Labor Council, AFL-CIO is pleased to offer eight scholarships for the year 2018. Each scholarship will be for $1,000. Only members of local unions affiliated with the Bergen County Central Trades and Labor Council, and their dependents, are eligible and may apply. We are giving four scholarships in the memory of Abe Solomon, the first elected president of the Bergen Country Central Trades and Labor Council, and four scholarships in the memory of Ed Purtill, the first Executive Director of the United Labor Agency of Bergen County, AFL-CIO Community Services. Click here to download the Abe Solomon Scholarship Application. Click here to download the Ed Purtill Community Service Scholarship Application. Please read all the eligibility requirements. Feel free to put this information on your website, and make as many copies that are needed for your membership. The Selection Committee requests that all applications are returned by April 14, 2018. Since the beginning of the scholarship fund 39 years ago, 172 scholarships have been awarded. On behalf of the Board of Trustees and the officers of the Bergen Labor Central Trades & Labor Council, thank you for your support and cooperation. The December 2017 Delegates Meeting of the Bergen County Central Trades and Labor Council, AFL-CIO, will be a holiday party, and will be held on Monday, December 11, at 6:30 PM, at the Stony Hill Inn, 231 Polify Rd., Hackensack, NJ. The newly elected officers of the Bergen CLC will be sworn in at this event. Please bring a new unwrapped toy, which will be donated to Greater Bergen Community Action, Inc. Please RSVP by December 4, 2017, by calling Janet at 201-967-5953. On behalf of the Bergen County Central Trades and Labor Council, AFL- CIO and in partnership with the Bergen County Building and Construction Trades Council, AFL-CIO, I would like to cordially invite you to attend a Cocktail Reception on Tuesday, September 26, 2017 from 6:00 pm to 9:00 pm at the Stony Hill Inn located at 231 Polify Rd, Hackensack. The proceeds of this event will benefit our Committee on Political Education (COPE) and support our Labor 2017 Member Mobilization Campaign. Click here for a flyer and order form. As you know, there is much at stake for working people in this year in the upcoming Gubernatorial and State Legislative election. Electing labor friendly candidates at all levels of government is crucial to achieving a working families agenda for our members. We hope to build upon our past success and continue to expand our program. These goals can only be achieved by a well financed and resourced Central Labor Council with the solidarity of the entire labor movement. Click here for a flyer and order form. For more information, please contact Janet Giuliano at (201) 967-5953. We hope your union will be able to attend the Cocktail Reception and contribute to our COPE Program. We look forward to your support and towards another successful election year for working families. 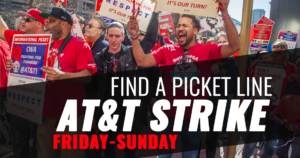 40,000 workers at AT&T just announced that they will walk off the job Friday at 3pm ET/Noon PT if they haven’t won a fair union contract by then. Vist https://cwa-union.org/att for updates. This will be the biggest strike in the United States since 40,000 Verizon workers walked out last year, and may be the biggest strike of retail workers at a national company in U.S. history. The Bergen County Central Trades and Labor Council, AFL-CIO is pleased to offer eight scholarships for the year 2017. Each scholarship will be for $1,000. Only members of local unions affiliated with the Bergen County Central Trades and Labor Council, and their dependents, are eligible and may apply. The Selection Committee requests that all applications are returned by April 15, 2017. Since the beginning of the scholarship fund 38 years ago, 172 scholarships have been awarded. On behalf of the Board of Trustees and the officers of the Bergen Labor Central Trades & Labor Council, thank you for your support and cooperation. At our last meeting, our delegates voted to endorse the Unity March and Rally “Coming Together to Defend our Values“. On Sunday, February 12th, join the Bergen County Concerned Citizens, for the Unity March and Rally “Coming Together to Defend our Values,” at the Bergen County Courthouse in Hackensack. Come together to celebrate and reaffirm our American values of freedom, diversity, and inclusivity, and to push back against hateful, divisive rhetoric. With one voice, we will send a clear message to those around the country who seek to drive us apart: We will not be divided, and we will not be silenced. Meet at 2:00 PM at the municipal parking lot near Foschini Park before marching to the Courthouse where we will hold our rally. National “Right to Work” legislation was introduced by Republican Congressmen Steve King and Joe Wilson on Wednesday. This anti-worker policy would be devastating to wages, benefits, and the ability of workers to have a voice on the job. Despite misleading rhetoric, “Right to Work” does not enhance the rights of workers; it is designed solely for the purpose of dismantling unions. This is a bill that threatens the foundation of the labor movement in all 50 states, and must be stopped. We need all hands on deck to defeat this bill. What you can do right now is call your members of Congress and tell them to oppose “Right to Work”. CLICK HERE for a directory of New Jersey’s Congressional Delegation. Numbers don’t lie, and the fact remains that “Right to Work” laws are simply wrong for working people. On average, workers in states with “Right to Work” laws earn less, are less likely to have employer provided health benefits, and see a higher rate of workplace mortality. For working people, many of whom are struggling to pay their bills and make ends meet, the introduction of such an ill-advised bill is not only an insult, but also a malicious attack on their livelihoods and ability to support their families. The fallout from this policy would be far-reaching. Not only would workers see their wages drop and standard of living undermined, but our economy and businesses, which rely on a vibrant middle class would be adversely impacted. The New Jersey State AFL-CIO urges its affiliates, community partners, businesses, and elected officials to vigorously oppose this destructive, anti-worker bill. CLICK HERE and make a call to your members of Congress urging them to oppose “Right to Work” and instead pass laws that support the right of working families to make a living.